Standing waves are non-traveling vibrations of certain wavelength and frequency which occur on a medium of certain size. The size of the medium controls the wavelengths of the standing waves. Also, the way that the medium is held at its ends, either fixed or open, controls the wavelengths of the standing waves. Only certain sized waves will stand on any one medium. A medium will not support an infinite number of standing waves of continuously different wavelengths. Practically, only a few waves, usually harmonically related in their wavelengths and frequencies can stand on any one medium. 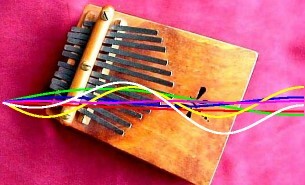 We say, therefore, that under certain conditions mediums can be 'tuned' since they will accept only certain vibrations. 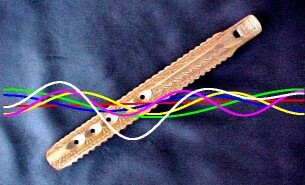 For example, each string in the piano pictured above produces only one primary note. 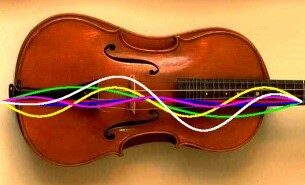 Each string is a medium that will primarily, or fundamentally, support only one wavelength or frequency. This makes the playing of music possible. How could one play music if, when a certain piano key was pressed and a certain string was struck, any note whatsoever rang from the instrument? Standing waves are also important in many branches of physics. In fact, electrons in atoms are sometimes viewed as standing waveforms. All of this will take a bit to unfold. Hopefully, the following links will help you understand standing waves. Standing Waves 1 - On a string, both ends fixed.